Linné on line -Linnaeus Doctor of Medicine – in one week! Linné on line The Life of Linnaeus Linnaeus the Doctor of Medicine Linnaeus Doctor of Medicine – in one week! Linnaeus Doctor of Medicine – in one week! Linnaeus left Sweden in April 1735, taking with him manuscripts for books and theses, much too little money and his Saami costume! In Hamburg he stayed for a while and there he was very interested in the city's Jews. At that time Jews were forbidden to enter Sweden. Then Linnaeus arrives in Holland. First he visits Amsterdam for a few days but then leaves for Harderwijk, a small port with a university. Many foreigners, including several Swedes, came to this city to take their degrees. It is said that as soon as a foreigner appeared in Harderwijk he was asked if he had come to take an exam. There was a song "Harderwijk is a market town where they sell kippers, bilberries and degrees". The bust of Linnaeus on a tower in Harderwijk. 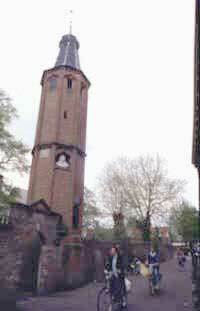 The tower was at one time used as a prison for students. 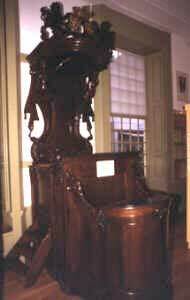 This is an exact copy of the lectern where Linnaeus stood when defending his thesis. Harderwijk museum. Linnaeus had written his doctor's thesis at home in Sweden. It was about the ague and was called "Hypothesis nova de Febrium intermittentium causa". It was only necessary for him to stay one week in Harderwijk to have time to print the thesis and "with presence of mind and considerable wit" to defend it during a "disputation" on June 23rd, 1735, thus getting his degree. It entitled him, among other things, to teach the art of medicine, visit patients and prescribe medicine.